connections, device configuration, and field device calibration and operation. The T5552-FF1A connects to the Level/Flow Process Control Learning System (T5552) and the Portable PLC Learning System (990-PAB53A) to teach this highly-effective communication protocol. Learners will also use Amatrol’s world-class, highly interactive multimedia to gain insight into the theoretical aspects of Foundation Fieldbus and to follow along with step-by-step explanations of hands-on skills, such as identifying the components of a Foundation Fieldbus segment and configuring a Foundation Fieldbus field device. The T5552-FF1A includes a variety of real-world industrial components like a differential pressure transmitter, EtherNet to Foundation Fieldbus linking device, Foundation Fieldbus H1 cable, 24 VDC power supply, and Intelligent FF interface unit. These real-world components found in process control and power plant environments can be used by learners to practice actual skills that they’ll use in the field. These skills include configuring a Foundation Fieldbus linking device to control communication on an H1 segment; calibrating a Foundation Fieldbus field device; and monitoring the operation of a Foundation Fieldbus field device. The T5552-FF1A’s curriculum focuses on combining the theoretical knowledge behind the function and operation of a Foundational Fieldbus network and how this knowledge will help in understanding the hands-on skills. As an example of the curriculum’s depth, learners will study topics like how components are connected to a Foundation Fieldbus segment, the cabling requirements for Foundation Fieldbus segments, the function of user layer blocks and objects, how a device is configured to perform process control functions and Foundation Fieldbus diagnostic and maintenance capability. This curriculum is presented within a stunning, highly interactive multimedia format that allows learners to explore the presented topics through text, audio narration, 3D animation, video, and interactive quizzes and games. In addition to Foundation Fieldbus, Amatrol also offers learning systems for two other process control communication protocols, HART (T5552-H1) and SCADA (T5552-S1). Amatrol has developed a full line of process control learning systems and will continue developing new products to meet industrial training needs. 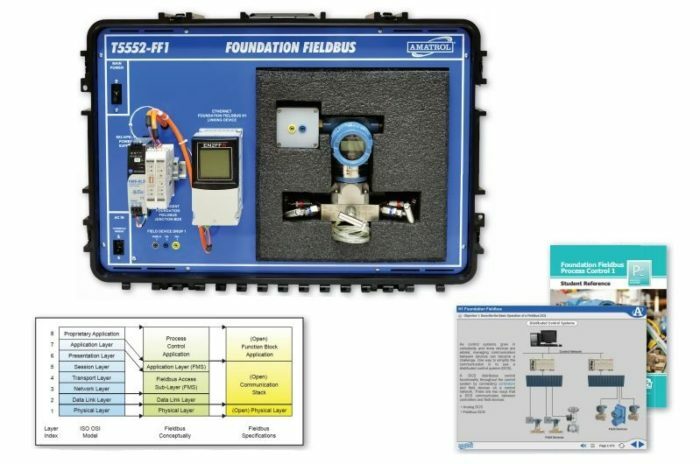 A sample copy of the Foundation Fieldbus Process Control 1 Learning System Reference Guide is also included with the system for your evaluation. Sourced from the system’s multimedia curriculum, the Student Reference Guide takes the entire series’ technical content contained in the learning objectives and combines them into one perfect-bound book. Student Reference Guides supplement this course by providing a condensed, inexpensive reference tool that learners will find invaluable once they finish their training making it the perfect course takeaway.